Have you listened to any of the constant barrage of financial news that always tells you the economy is terrible, even when it's not? It seems that no matter whether the economy is good, bad, or indifferent, the news always has a negative slant. You rarely hear much about abundance and what's going right in the world. But there is one thing I've noticed in the wealth of financial information that I see every day. That theme is the theme of scarcity. Most of what you hear comes from a scarcity mindset that seems to be pervasive no matter where you turn. But you don't have to buy into that. In fact, if you do it may be one of the big things holding you back from your biggest successes in life! Read on and I'll show you why God wants only abundance for your life and how you can make that happen. I'll also share a little about my own struggle with the abundance vs. scarcity mindset. When you see people giving financial advice in the media, what is the first thing they always recommend? Most experts recommend things like cutting back on expenses such as eating out, cable TV, coffee, and designer clothes. This is especially true when economic times are tough like they were a few years ago. Of course, cutting back on expenses CAN be a good place to start if you’re struggling financially. It's something you should certainly do if you’re spending too much and having trouble making ends meet. Even the Bible says you should use your money wisely and take close account of it so it’s not wasted. But is cutting back and focusing on lack and scarcity the only way? Is trimming the fat from your budget the only way to set you up for abundance in your finances? Cutting waste out of your budget definitely helps your finances work better (assuming you even do a budget), but it only helps to a limited degree. Of course, it's very wise to get rid of expenses that add little or no value to your life, causing more burden than they do joy. But if you start cutting too much out of your budget, then you start to limit yourself. You’re limited because you can only cut so much. When you get to the point where you’ve cut so much that it saps the joy out of becoming debt free and living a normal life, then the cost cutting starts becoming more of a burden than a help. That kind of cost cutting is psychologically unsustainable over the long term. It may eventually cause you to fail at your goal of becoming debt free. This misguided mindset that says the only way to succeed financially is by relentlessly cutting expenses is part of what I call a mindset of scarcity. When you have a scarcity mindset, you acknowledge the belief that there are only so many resources available to you. So you have to trudge along, doing what you can with what you have. All the while believing you can save your way to wealth through cutting coupons and eating ramen noodles. Don’t get me wrong, managing your finances well, minimizing waste, and saving are all good things. In fact, those things are absolutely essential to being financially successful. However, they work so much better when paired with the right mindset and actions. There is more to life than lack and deprivation. 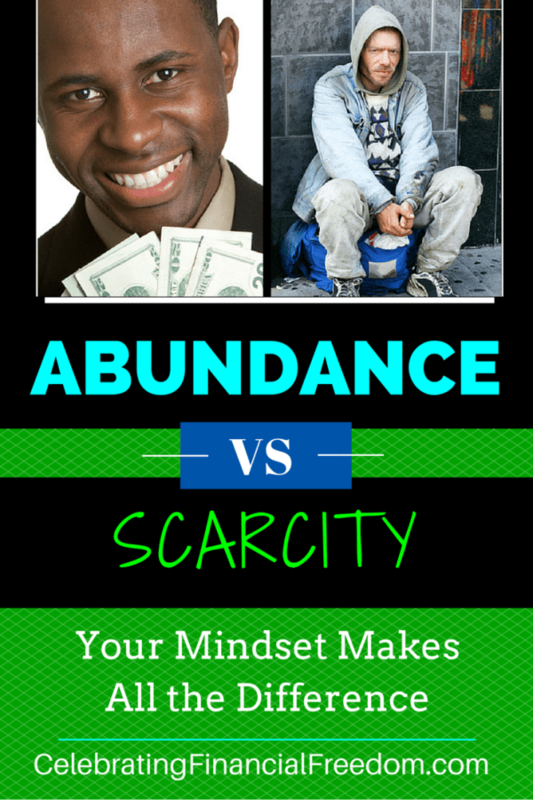 When you live with a scarcity mindset, massive abundance is not a consideration. This is because you’re taking a defensive posture with your money and your thinking. You do what you can to preserve and protect what money you have, and maybe even increase it a little, because now you’re saving money you once wasted. But there is so much more abundance that God wants you to have because it's His nature to want you to prosper instead of just getting by. He doesn’t want you to have a mindset of scarcity. But achieving abundance in your life means you have to have an abundance mindset if you want anything more than the bare minimum for you and those connected to you. God wants more abundance for you than you can imagine, because that is His nature. Think about it- He created everything and all He had to do was speak it into existence. He made it all for us to experience and enjoy. Our only limitations are what we do with what He has provided for us. When you understand that and learn to tap into the infinite abundance He provides, you'll start to change your mindset from one of preservation and scarcity to one of infinite provision, expansion, and increase. I have to admit, there have been times in my life when I gave in to a mindset of scarcity. I've been guilty of being so defensive financially, I missed out on opportunities to make a lot of money. Unfortunately I was so focused on not spending money (or so afraid of losing it) that I missed out on some of those promising opportunities. Over time I've come to realize that when God brings you an opportunity that promises increase, He will provide a way even if it doesn't seem possible at the time. So now I always try to make sure I look at things through abundance colored glasses to ensure that I don't miss out on the good things God has in store for me and my family. God wants you to experience all the abundance He can send your way. But in order to experience that abundance, the first thing you have to learn is to be proactive . So what does it mean to be proactive? I think one of the best ways to be proactive is to work on finding ways to increase your worth to the world. In order to see the exponential increase that you want and the He promises, increasing your value to the world is a game changer. Every one of us is uniquely made by God and because of that, each of us has a combination of abilities and talents that are valuable to the rest of the world in some way. The world wants your talents, your skills, and your works. The more you make the effort to develop and improve yourself and the unique abilities God gave you, the more the world will reward you with those little green rectangular certificates of appreciation that we all desire. When you understand that developing yourself and using what God gave you for the benefit of others, you begin working from a mindset of abundance. You realize there is no limit to how high you can go and how much you can change the world. You realize that being proactive by consistently building up yourself and others will always reap larger benefits in all areas of your life (spiritually, relationally, financially, etc.) than when you become defensive and merely build a fortress around your life and your finances. So you have to remember, if you really want to go places in life, not just financially, but in any area, you should first recognize that God’s universe is infinite, and He wants you to experience that limitless world. But it only happens when you approach life from a mindset of abundance. If you want more money, friends, influence, love, or anything else, you first have to put yourself out there. Begin providing the abundance of who you are and what you can do for the rest of the world. You have to begin exerting the influence and value that God inherently put inside all of us, including you, by providing your unique value to the world. Hiding your light under a bushel never works to create abundance. Maybe you know how to do very complicated scientific research that could someday lead to a cure for cancer. Maybe all you know how to do is clean a house really well. When you do it with excellence and do it as unto God, the abundant benefits always follow. When you understand that the world is an abundant place (no matter what you hear on TV) and there is more than enough for all of us, then you'll find the key that unlocks the treasure chest of prosperity in your own life. Then you and God can start directing that abundance to you in unexpected ways. It’s not always easy, but when you gain the right mindset and begin consistently striving to add value to the world by what you do and how you do it, then you will have the abundance you want for your life, guaranteed! This is seriously the best article on financial advise/freedom that I’ve come across since researching this topic (diligently about 1 year now). God is Good! It FINALLY makes sense to me! It’s such a simple concept! I’ve constantly read the “world’s” views and advice, but have seen emptiness behind it all. This article puts everything into perspective for me, inspires me to dive more into the Word of God, and to start walking in His abundance! Thank you! Wow, that’s awesome! I’m so glad it helped you get the right perspective. I’ve written a lot more articles like this one about biblical money principles, mindset, etc. Just use the search feature in the upper right sidebar to search what subjects you’re interested in. I think you’ll like what you see!